Crystal Rivers Veronica Jeepers Creepers USA Perennial Plants Veronica Crystal River? Crystal Rivers Veronica Veronica Crystal River? An exceptionally good hybrid Speedwell, this forms a very low spreading mat of glossy evergreen leaves. 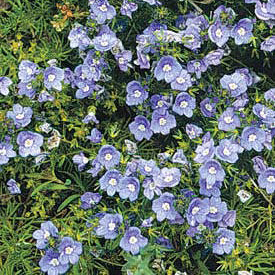 Tiny sky-blue flowers smother the plant in mid to late spring, then appear now and again through the summer. Plants tolerate a range of different soil types and conditions, from moist to dry. An easy low-care perennial. 'Reavis' Crystal River Veronica is suitable for growing in between flagstones or along pathways, and excellent as a massed groundcover over a large or small area. Easily increased by dividing plants in early fall or spring.